Learn more about School Fab Lab at #Fab14! 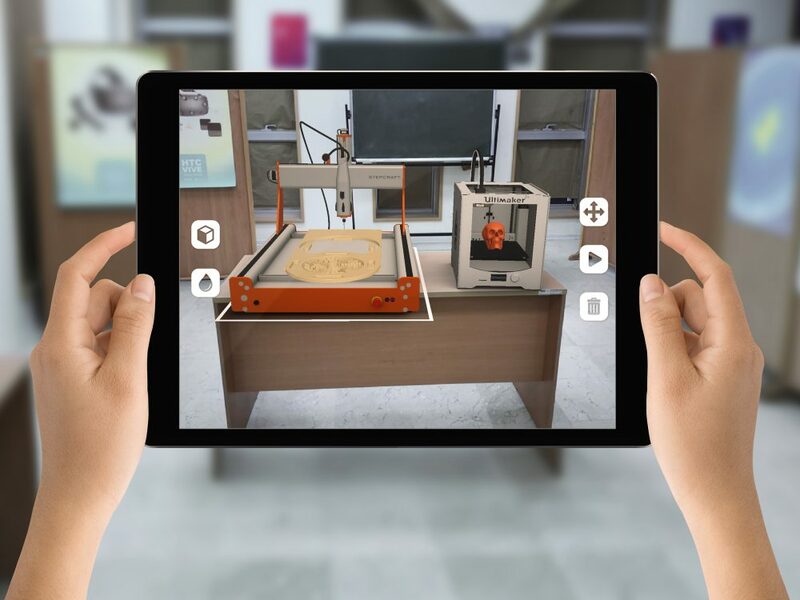 “Augmented Reality in Fab Education & School Fab Lab Mixed Reality” is the topic of a Workshop at Fab14 in Toulouse, France, on Thursday, July 19. The Co-Founder of Fab Lab Connect and School Fab Lab, Nader Shaterian, will be presenting the workshop from 5:00 to 7:00 PM local time on Thursday. Educators and Fabbers can use the SFL AR App to experiment with placing machines, and then see them function in a customized space. The mixed reality space can be recorded and shared through video. – Share your video with others. The SFL AR App is available now at the Apple App store. These two images do not exist in “real life”! They are examples of changing reality with Augmented Reality! … but this slide demonstrates how machines and equipment can be placed ANYWHERE using the SFL AR App. Fab Distributed on July 14th and 15th had 8 locations and themes to choose from: AGROFOOD in Albi, ECOLOGY in Auray, ECONOMY in Perpignan, EDUCATION in Bataville, Grand-Est, ENERGY in Clermont-Ferrand, MOBILITY in Le Puy-En-Velay, SCIENCE AND RESEARCH in Paris, and SOLIDARITY in Auray, France. Finally, FAB14, the 14th International Fab Lab Meeting, is being held in Toulouse, from July 16 to 22, with “Fabricating Resilience” as its central theme. About Nader Shaterian and the Fab Lab Connect team.